The Fried Bologna sandwich from Hop River Brewing Company on North Harrision Street. The White BBQ Chicken sandwich from Hop River Brewing Company on North Harrision Street. 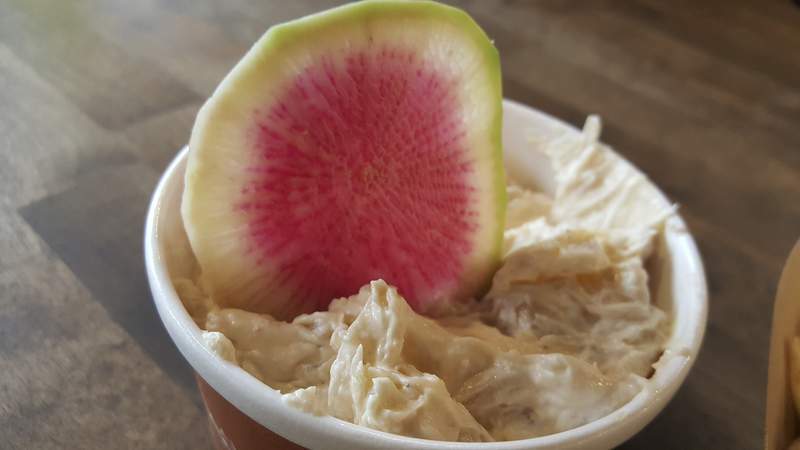 The watermelon radishes were the best dipping vessel for the onion dip at Hop River Brewing Company on North Harrision Street. 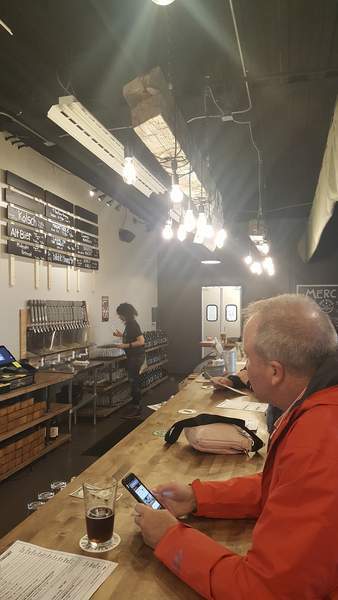 The bar at Hop River Brewing Company on North Harrision Street. 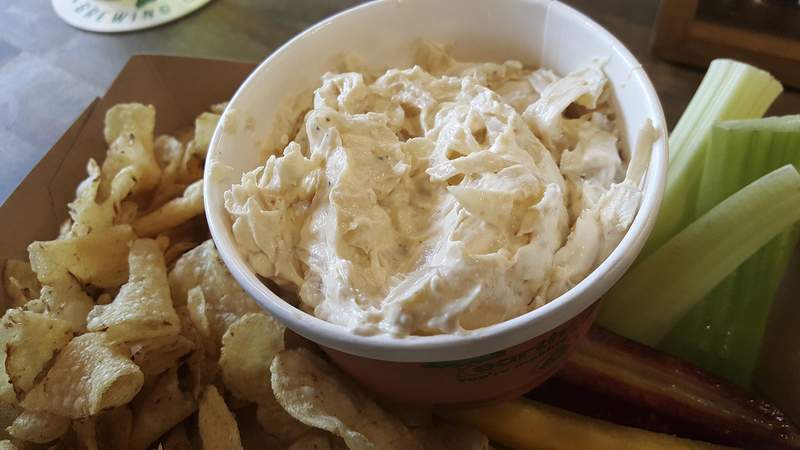 Caramelized Onion Dip from Hop River Brewing Company on North Harrision Street. Spicy Italian sub from Hop River Brewing Company on North Harrision Street. Thinly sliced house-made seitan meat alternative on the Philly Cheese "Fake" at Hop River Brewing Company on North Harrision Street. 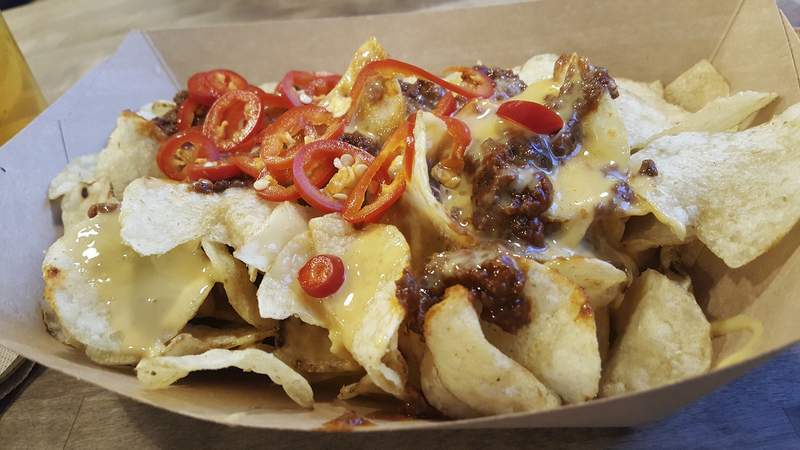 Sloppy Nachos from Hop River Brewing Company on North Harrision Street. The Collard Greens and Roasted Sweet Potato salad from Hop River Brewing Company on North Harrision Street. The brsket sandwich from Hop River Brewing Company on North Harrision Street. Hop River Brewing Company on North Harrision Street. 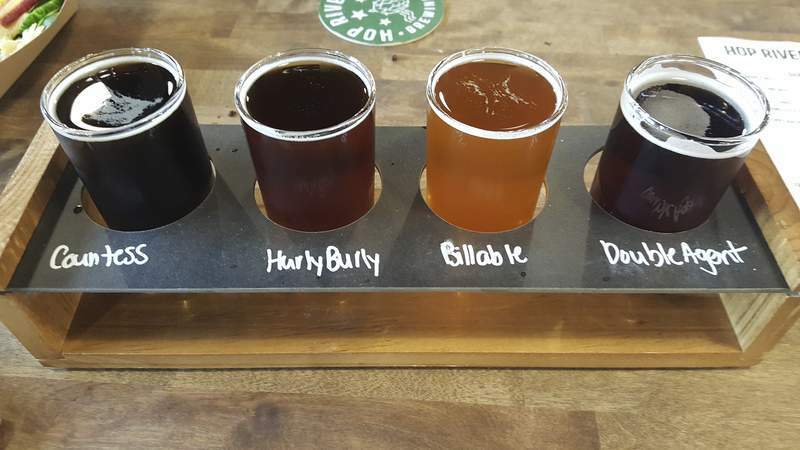 A beer flight from Hop River Brewing Company on North Harrision Street. Chili-Lime Nuts from Hop River Brewing Company on North Harrision Street. 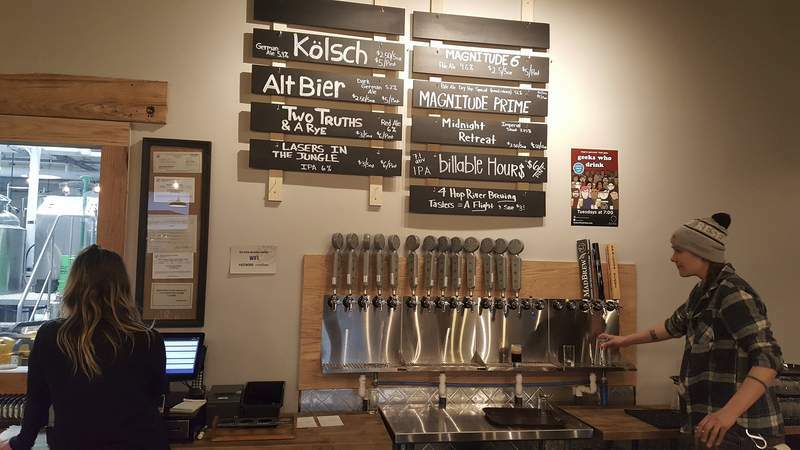 The taps at Hop River Brewing Company on North Harrision Street. It seemed like such an odd location for a brewery at first, but when all was said and done I decided it was the perfect place for this brewery. Hop River Brewing Company doesn't have a bright, shiny sign directing you to its home on North Harrison Street. There is nothing around it to draw traffic, and you honestly have to look for it. But inside you will find a jewel of a place with a chill neighborhood vibe that not only fits its purpose, but fits the rather quiet location. 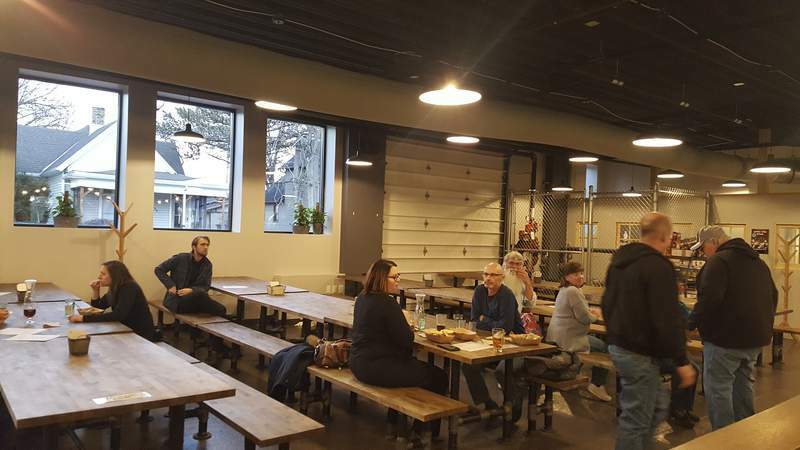 Its an open concept with German beer hall-style picnic table seating, so getting to know your neighbor will be a must if it is busy. I appreciated the added comfort of the extra-wide seats on those tables so you won't have to worry about embarrassing yourself by careening off the back of the picnic table like your uncle did at that one family cookout no matter how many beers you sample. 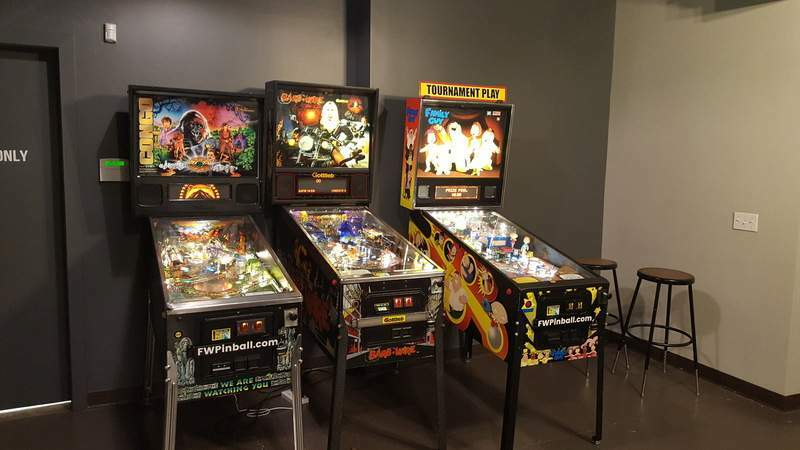 Its minimalist design has a warehouse feel; there are a handful of pinball machines near the front entrance and a shelf full of board games in the back, which were nice touches to the family-friendly place that also has a small children's menu. And there were plenty of little ones playing those games on the Saturday afternoon I visited, which only emphasized the friendly neighborhood vibe. 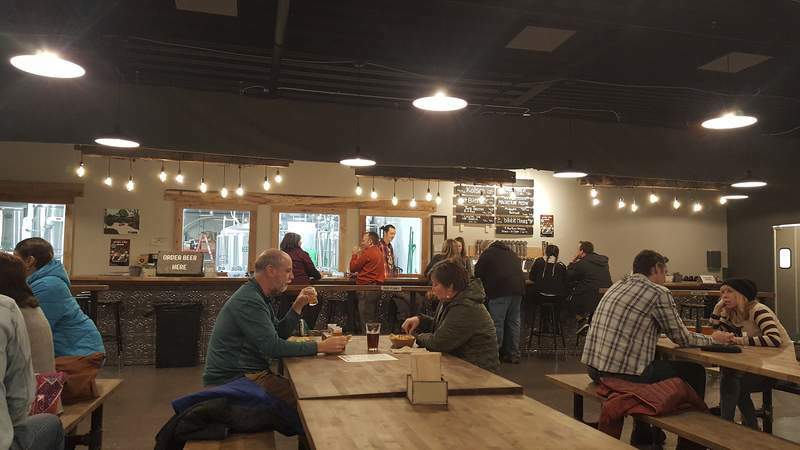 The menu was also minimalist with just sandwiches, one salad and “shareables” to munch on while sampling from the 12 taps, all but three of which featured Hop River's own creations. The best shareable was as tasty as it was pretty. The Caramelized Onion Dip arrived in a little paper container – all of Hop River's vessels were made of recycled materials, which was a thoughtful touch – sitting on top of a basket almost hiding some kettle chips and the prize jewels of this appetizer, an impressive mix of fresh vegetables for dipping – purple carrots, yellow pepper spears, celery, cucumber and bright, vibrant watermelon radish slices. They were so nice I barely touched the chips. The radish was the best vessel for the creamy dip, which was chock full of strands of caramelized onions. Those pink beauties added just the right peppery zip the dip needed. At just $2 per serving, the seasoned peanuts are a must-get. 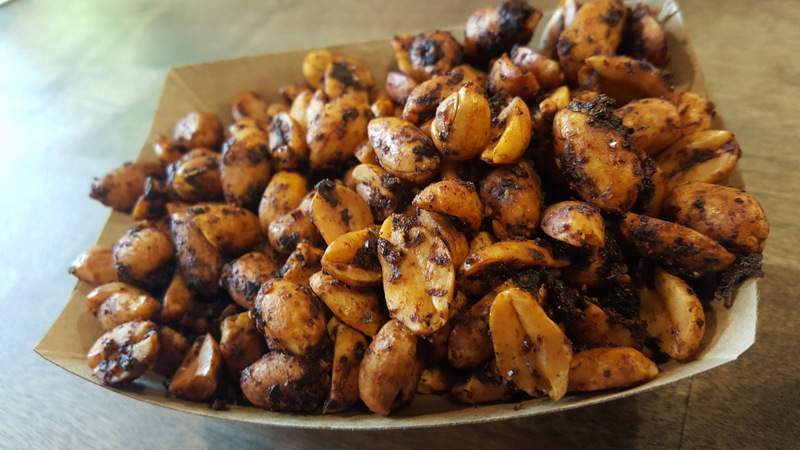 The Maple Nuts, which were bacon-maple nuts for a while before a recent switch to make them vegetarian, were not overly sweet and had just enough salt to keep them that way. They were slightly better than the chili-lime, which were also worth trying with a tangy citrus flavor offsetting their peppery rub. They were, however, a little charred. The best sandwich, actually the best thing overall, was the White BBQ Chicken. 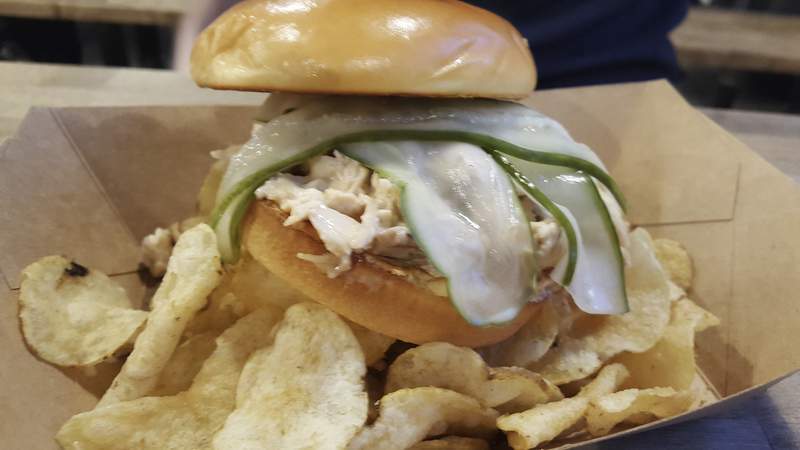 LaGrange County's Gunthorp Farms' roasted chicken was mixed with a zesty white barbecue sauce and topped with two thin pickle spear slices on a shiny toasted bun. The sauce was delicious, the chicken was tender and stringy and the pickles were perfect – just crunchy enough and not too strong in flavor. The braised brisket was also completed by its accouterments. 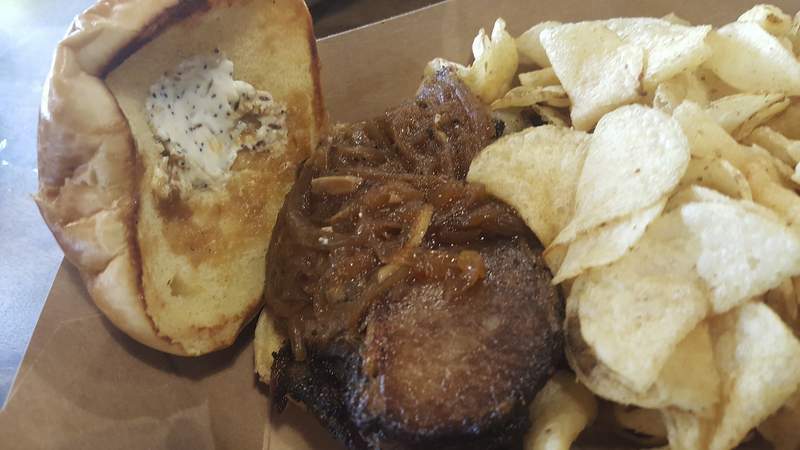 The thick beef slices from Fort Wayne's Wood Farms had a coffee rub that was quite savory so it needed the sweet kick it got from the caramelized onions on top. It had the same quality bun and a smear of everything-bagel cream cheese that was kind of lost. It needed about twice as much. I was most excited to try the fried bologna and it was tasty, but could have been much better. 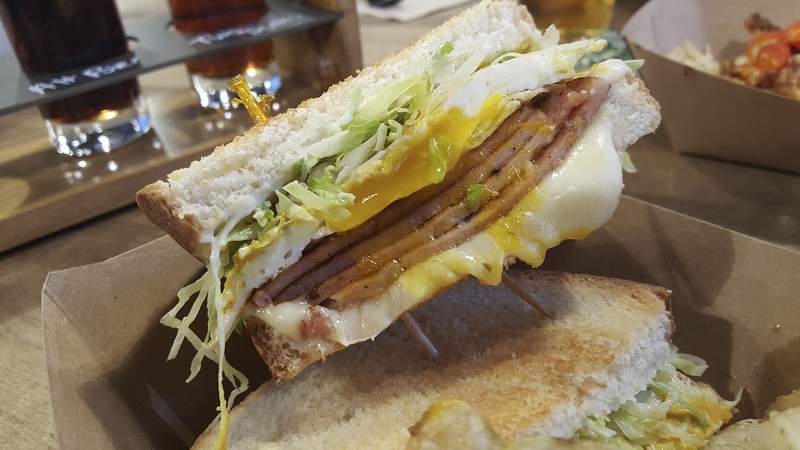 The Smoking Goose Meatery marinated bologna was topped with a fried egg, cheese, lettuce and a wonderful cayenne-infused house mustard. I got the egg runny and it oozed all over the slices of meat along with the melted provolone, but the bologna was not fried long enough. Had it been much crisper around the edges and hotter (the sandwich was barely warm), it would have been brilliant. The Collard Greens and Roasted Sweet Potato Salad would have been welcome on the menu at any high-end eatery. Slivers of collards and cabbage were mixed with red onions and whole cashews with the thinly sliced potatoes resting on top. 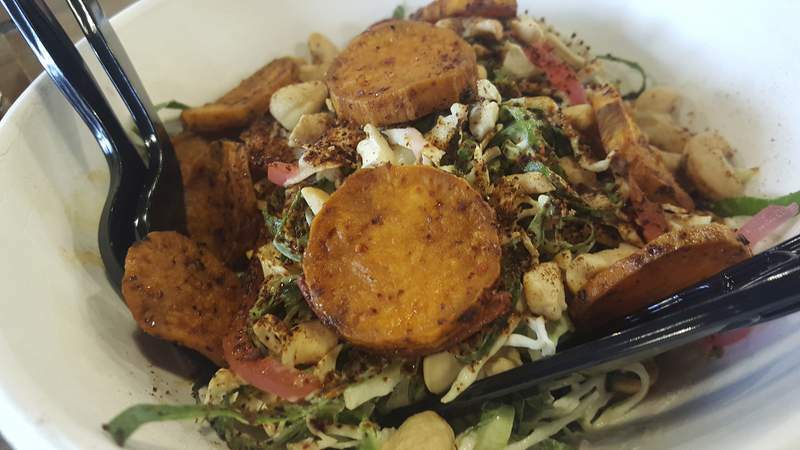 This vegan option had a bright, acidic cashew dressing that paired well with the super-sweet potatoes, and that dressing was present on every bite. 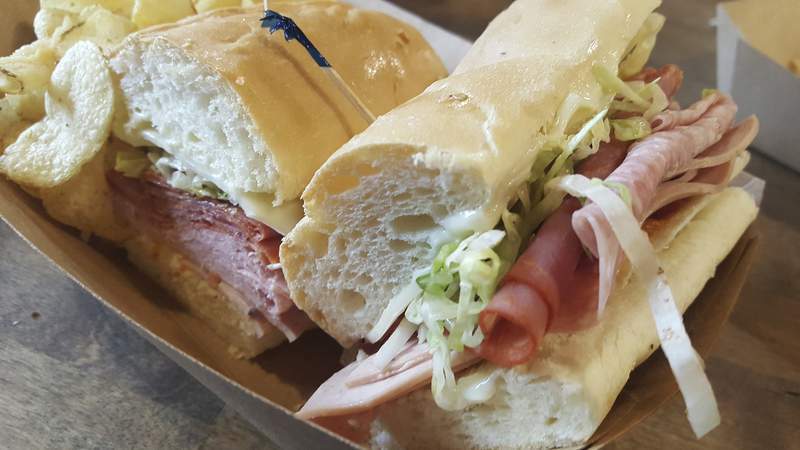 The Spicy Italian sandwich had an impressive mix of meats – spicy capicola, salami, pepperoni and peppercorn-spiked mortadella – provolone cheese, lettuce, mayo, Italian dressing and a hot pepper spread. It was a cold sub and probably would have been better hot, and there was not enough of the pepper spread to make an impact. The Philly Cheese “Fake” was served on the same soft, fresh sub roll and that roll needed to be toasted for this selection. 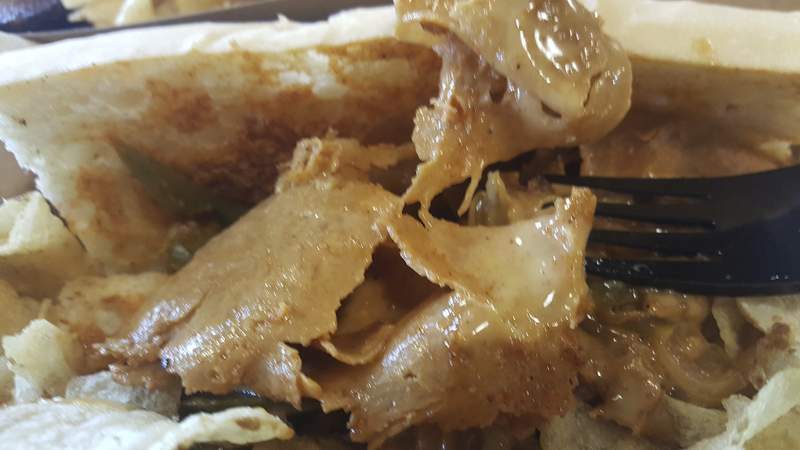 The beer-marinated and house-made seitan (wheat gluten protein) meat alternative was thinly sliced like the beef would be on a regular Philly so it looked the part. But it had Alt Bier (a dark German ale) cheese sauce, which kind of melted into that soft protein and made for a mushy sandwich that begged for some texture. It had good flavor but without the toasted bun or any other crunchy additions – the peppers and onions on it were sautéed until soft – it was rather boring. The Sloppy Nachos also came off as boring at first. The sloppy Joe beef was perfect with the right tangy-sweet tomato sauce, the super-crunchy kettle chips worked, and I could have used about three times as many of the pickled Fresno peppers as they were the real star of the dish. Next time I will ask for the Alt Bier cheese sauce on the side to pour over it because the majority of it was hiding in the bottom of the basket the nachos were served in and the dish would have been much better with more of it on top. Everything else shined at Hop River Brewing Company, however. The beers were fun to try and I loved the fine detail that the flights included. The four 5-ounce taster glasses of beers came in a black holder that had the name of each written in white in front of each glass. So many other places just give you a little sheet of paper that makes it hard to keep track of which is which in their holders. The service, though not tableside, was great. The folks there were friendly, made recommendations and I never once felt overlooked. Hop River's location makes it a place you might easily overlook, but you shouldn't. There is just something about it, the sum of its parts, that makes it something special. Address: 1515 N. Harrison St.
Ryan DuVall is a restaurant critic for The Journal Gazette. This review is based on two unannounced visits. The Journal Gazette pays for all meals. Email him at rduvall@jg.net; call at 461-8130. DuVall's past reviews can be found at www.journalgazette.net. You can follow him on Twitter @DiningOutDuVall.